Design a space that will grow with both baby and parents. Listen up, parents-to-be—gray is the new pink or blue. When it comes to decorating the nursery, more and more families are opting for soft, neutral tones over the bright, themed, gender-specific designs of the past. But that’s not the only change going on in the world of baby-room design. We checked in with some of the metro area’s top interior designers to find out what’s hot and what’s not, and they offered lots of advice on things to consider before you buy that big bag of garish stick-on wall giraffes. For starters, the décor tastes of grown-ups are being taken a little more seriously. A project Lawson recently completed for a family expecting a baby girl, for example, opted for cool-toned blueish-gray walls rather than pink. Layered rugs over the hardwood floor add warmth and texture, while a white dresser’s gold-bar drawer pulls give the room a grown-up, luxe touch. 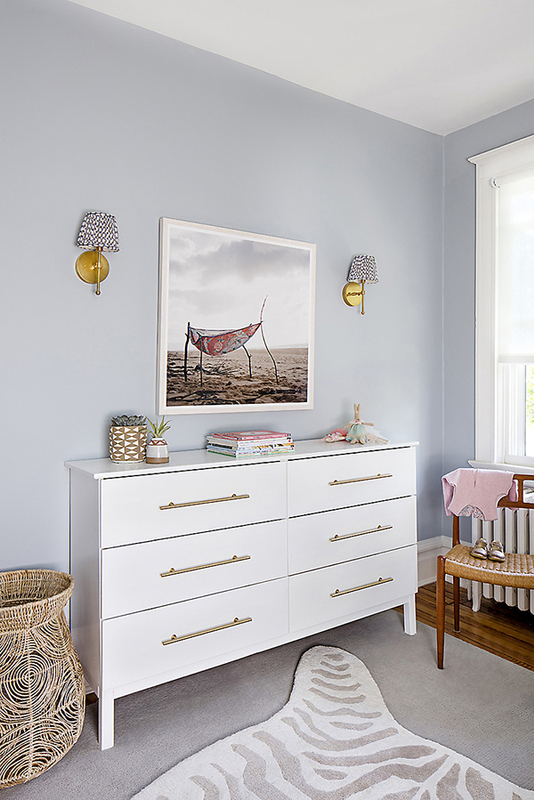 Absent are the typical baby animals or ABCs art—instead, a framed photo print of a dusty pink handkerchief on a sandy beach complements the room’s soft color palette. “We’re also designing with a lot of wood tones and natural materials,” Lawson adds, pointing to the wicker baskets used for storage, unstained natural wood crib, and watercolor bedding. While it’s a good idea to let a favorite print or accent color inspire your design, Lawson points out one reason parents should avoid anything too “theme-y.” “Grandparents and other family members have the tendency to get carried away, and you’ll be seeing elephants and ducks for years to come,” she says with a laugh. The grown-ups can also win this one: Creating a room that will outlive its initial raison d’être can mean adopting furniture styles and color palettes found in the kitchen and adult living areas. While two white models of Bratt Decor’s classic-looking iron cribs are its best sellers, Bauer says she’s seeing a rise in black, too. But regardless of the color or style, parents most value furniture that grows with their child. It’s a concept Ashley Barbalato took to heart when putting together the nursery for her now 14-month-old son, Julien, in the Riverside rowhome she and her husband recently remodeled. While Barbalato stuck to the neutral tones across the walls and furniture, she infused the space with pops of texture and personality with a few fun pieces, including a fluffy “rocking sheep”—a Nordic take on the traditional rocking horse—made from natural carved wood and soft cream-colored fur. In the center of the ceiling hangs a fanciful light in the shape of a gold crown that looks as though it was plucked from the head of Max in Maurice Sendak’s classic children’s book, Where the Wild Things Are. Our panel of designers also offered some useful advice on planning the space. Most expectant moms do the bulk of nursery prep in the second trimester, according to a reader survey by The Bump, a website for first-time millennial parents. Cribs and other furniture can take 10 or more weeks to be delivered, so experts recommend parents make selecting and ordering it a priority. When creating your own checklist, think about your specific needs. Will the baby’s room be hit with a strong afternoon sun? Blackout curtains are a must, then, for making mid-day naps easier. Live on a busy street? Consider a sound machine to cancel out outside noises that could keep baby up. Flexible lighting options—like a soft lamp and night light in addition to the overhead light—can help you adapt the brightness for the room’s many uses, from playtime to middle-of-the-night diaper changes and feedings.